I am packing my art supplies getting ready to hit the road! I will be in San Diego next Saturday teaching a mixed media portrait workshop at Lisa Bebi’s gallery. 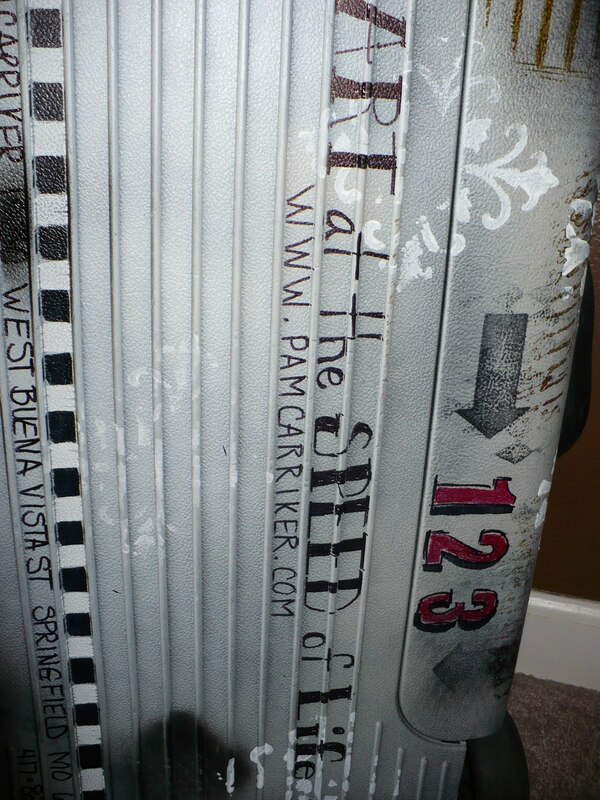 Since traveling with art supplies can be a tad tricky, I decided to take an old suitcase and dedicate it towards this purpose. This hard sided roll-aboard relic was one of hubby’s old go-to-work pieces. It has seen better days for sure, so painting it up was a not an issue. I used three colors of spray paint intended for use on plastic. It worked like a dream. Add in some gesso, Sharpie Markers, and Staz On ink and my art supplies will arrive in style! I’m making a stop at Stampington to meet with the editors. This will be one of the highlights of my trip. After only email communications and the occasional phone conversation, I am excited to finally meet them in person. I might even see if they want to doodle a bit on my suitcase Art Journaling style. I filled the inside with plastic containers so if something does spring a leak it won’t hurt too much. Take your ART to NEW places! Live Art at the Speed of Life! 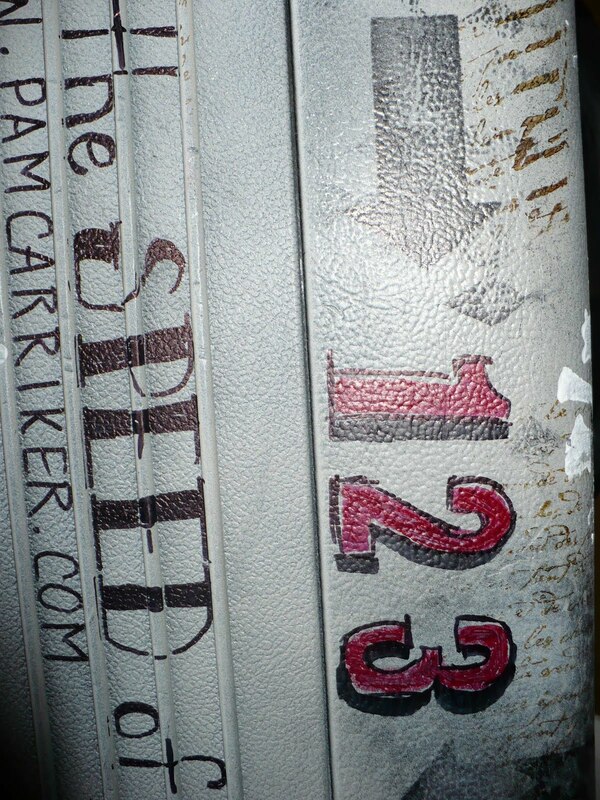 love your old suitcase! you did a magnificant job. good luck teaching your class! how fun! What a hoot, such a fun way to travel artfully! I agree with Nancy, can you show us the inner workings of the art bag! this is a wonderful piece! this should be featured in one of the stampington publications! Great bag! Have a good time in CA! Exceptionally cool art travel case!!! I love it!! You've made your suitcase super-cool!! Love it. Have fun on your trip. What a great way to tote your art supplies about with you.I hope you have a wonderful & healthy trip. How fun it will be to travel with that case! 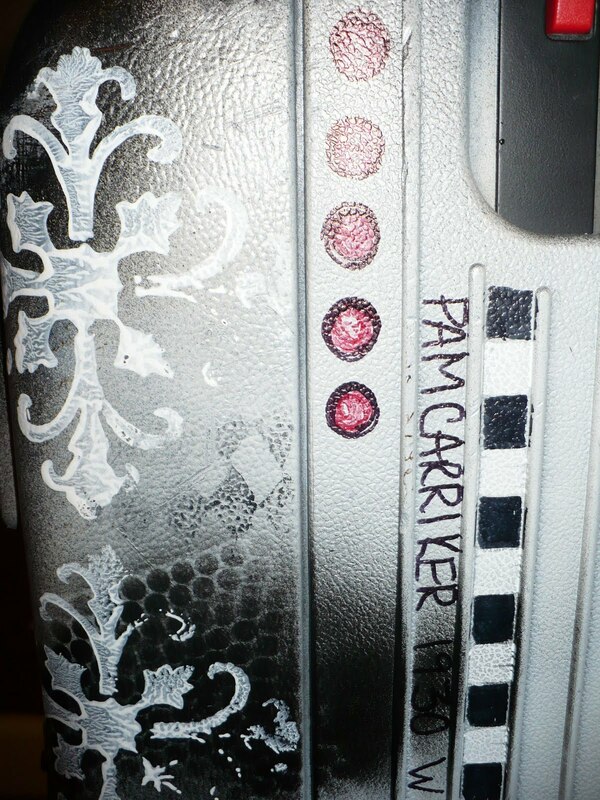 Pam, I love it! How very cool! I think that surrounding ourselves with stuff like that just inspires us even more, don't you? Brilliant idea! I love the bag! Hope your trip is great. That is the most creative suitcase I have ever seen. People will be in awe of you, thinking you MUST be some famous artist! Wow, that is such a cool bag! Ha, very unique and fun. Well, think about us while you are having fun…..okay, never mind….just have fun!